i am Jagadeesh kumar aged 31, residing at Tirupur Tamilndu.I am suffering from chronic kidney diseas wherein my both kidneys were not working for the past 10 m0nth. 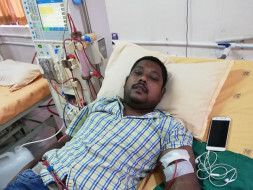 Now i am undergoing dialysis treatment. Doctor advised for the immediate kidney transplantation. Fotunatly my mother is donating the kidney. My kidney transplantation operation cost 7 lakhs rupees.Since i am a privte company emplayee earning 12000 rupees per months, I am unable to bear such a huge amount. I am having a two year old boy for him i have to stay alive.So hereby i request all the big hearted friends to donate me for the survival of my life and my family.